While it’s never a safe bet to celebrate anniversaries of old video games that the Internet tells us were released on the last day of a month, since few-and-far-between sources tend to have a more accurate date, this one has nothing holding us from doing just that. (Presumably!) exactly 20 years ago, the American release of the original RollerCoaster Tycoon happened. In essence, it was created by three people – Chris Sawyer as programmer and designer, Simon Foster as artist, and Allister Brimble as the audio/soundtrack composer. The game borrowed a lot from the same team’s 1994 legend Transport Tycoon, from the isometric view, through the general controls, even the fact that they were written in assembly code and ported to Windows by the same company, Fish UK. Already in 1997, RollerCoaster Tycoon (with working title White Knuckle), when it only had roller coasters, looked ahead of its time. What Sawyer originally envisioned as a simulator of roller coasters became a fun park game that would ultimately overshadow Bullfrog’s Theme Park series. 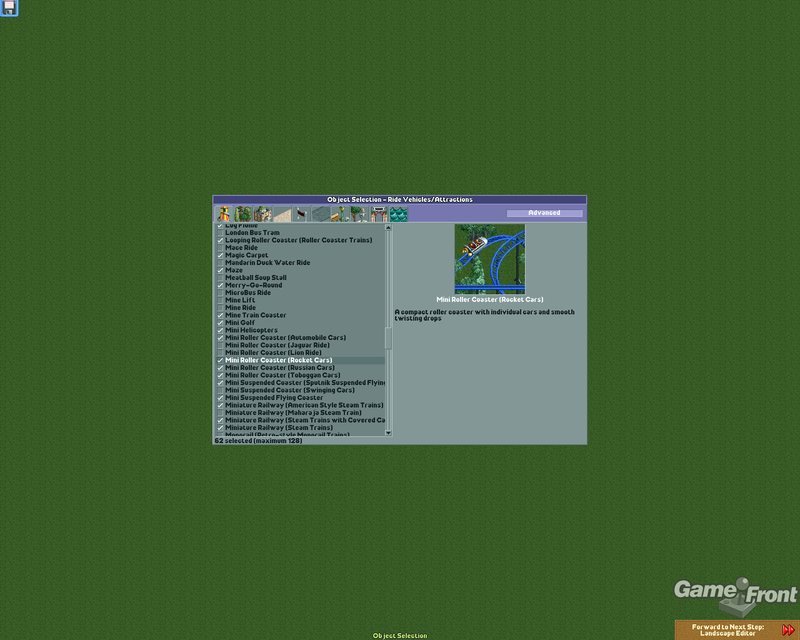 Whereas the latter focused more on the management part of the gameplay, RollerCoaster Tycoon not only took that but enabled the level of customization that was up to then unseen. A large percentage of rides could have any number of track designs that were built by players or were given by default, and then those same tracks and even trains could be painted in multiple different colors. Don’t like the terrain? Here, have land and water editing tools, and go to town with replacing grass with sand or chess boards. And here’s some scenery that guests can acknowledge and enjoy for good measure. Oh, and have the same color tools you paint your rides with become applicable to flowers and staff uniforms. This little world is yours to personalize. That’s all well and good, but if someone back then would make a game with that many details going on at the same time, computers of the time would’ve spontaneously combusted, so what were the minimum system requirements? Any Pentium 90 that could run Windows 95. And Pentium 90’s were on their way out, since almost all other games in 1999 required at least a 166. Therein lies the magic of assembly code. While I would put anyone who uses it on suicide watch due to the fact that it’s difficult to comprehend what goes on in any given moment, assembly code directly handles a computer’s memory, therefore it can be used to optimize the behaviour of the software it is trying to create and claim as few resources as possible if the code is good enough. And indeed it was, even on computers of the time, every scenario in RollerCoaster Tycoon ran pretty much without any loading times to speak of. The game sold like mad, and was even bundled in cereals and pizza roll boxes. The public wanted more. In November 1999, the first expansion came out, and its name depended on your location – in Europe, it was called Added Attractions, and in North America, it was called Corkscrew Follies. Its European title did not fully communicate what was new – other than new rides, it brought new and far more challenging scenarios (including one real park, Alton Towers), path signs that could be used to block certain areas to non-staff (no more “I’m lost” messages, heh), and expanded list of rides and purchasable items that could be painted. Guests no longer had to have numbers identifying them, as you could toggle between names like “Guest 234” and “Jimmy H.”, and staff could be renamed as well for all those OCD staff zone users. To top that all off, all the new options except the new rides were applicable in the base game’s scenarios. Woo! The original game with expansions could simulate real-world parks to a pretty high degree, but the engine had reached its limits and a sequel needed even more optimization. As if that wasn’t enough, September 2000 saw the release of the second expansion called Loopy Landscapes, which was a less additive one, bringing even more parks (with two real ones, Blackpool Pleasure Beach and Heide-Park), and the ability for rides that are not merry-go-rounds and dodgems to play different music styles. The new scenarios could have entrance fees removed just to spice things up, and some did not have any money involved, making them sort-of sandboxes. However, this expansion did include the entirety of Added Attractions/Corkscrew Follies content for those who had missed it, so that’s a plus. By that time, Bullfrog had created a few Theme Park sequels, but even with EA’s money and marketing teams, they failed to get much attention. A sequel to RCT was underway, and one can imagine the expectations people had of it. However, on 14 October 2002, RollerCoaster Tycoon 2 was released to an early case of discrepancy between the opinions of reviewers and gamers. 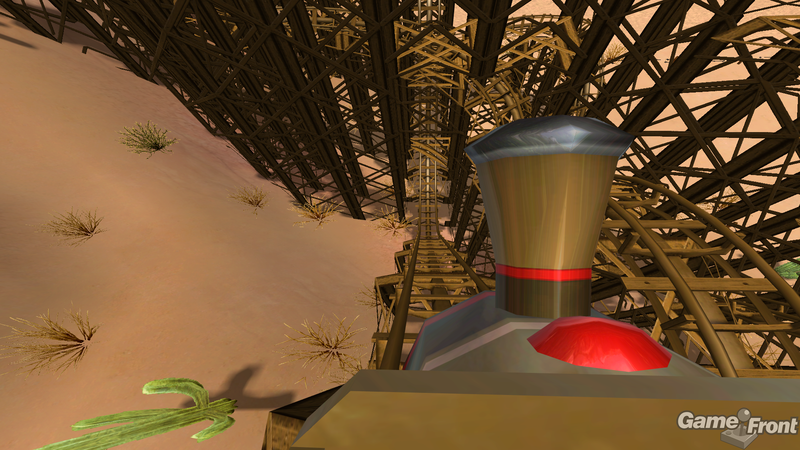 While the reviewers lamented how it was largely the same game, the players immediately understood what Sawyer wanted to do with the sequel – the game had an optimized engine with a slightly better guest and staff AI, more frames were made for trains, many new rides were added, many new concepts even (first aid rooms, ATM machines, mass scenery removal tool), as well as some basic in-built editors so people could make their own scenarios and share them with others without resorting to creating their own tools. There was even a “hidden” option to import up to two custom audio tracks to be played as music in the game. Oh, and there were Six Flags-licensed parks and items, just in case. While the graphics were somewhat polished, Sawyer had only one real focus – gameplay. And according to millions of fans around the world, he succeeded in doing just that. Most fans still consider this to be the peak of the series, as it gave them the freedom to make their own experiences. At the series' peak in popularity, 2002 also saw the releases of a licensed board game and pinball machine(!). Although not without limitations, the editors in RCT2 increased the game's longevity to... well... I think it's safe to say INFINITY. Things took a bit of a strange turn immediately afterwards. 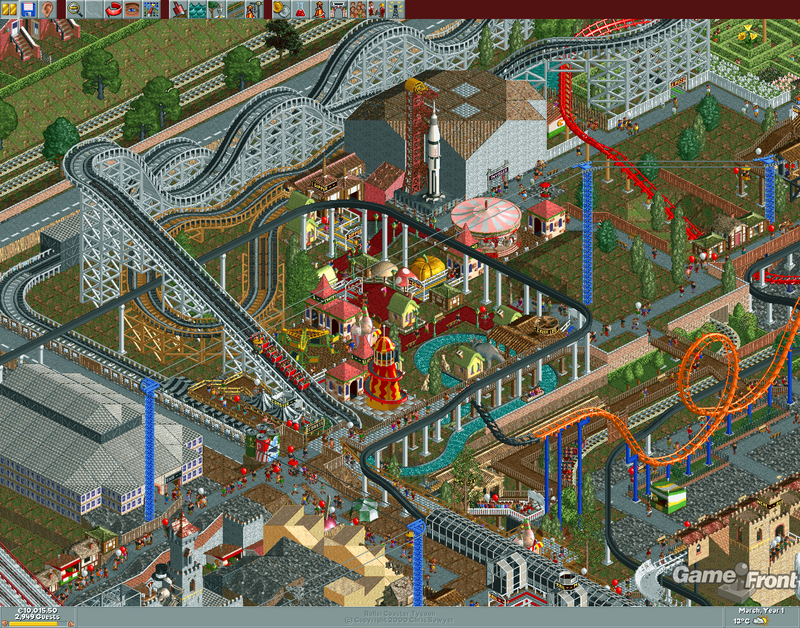 Sawyer was not directly involved in the expansions for RollerCoaster Tycoon 2 – instead, the first studio not controlled by him entered the scene – Frontier Developments. Contrary to the expansions for the first game which added gameplay elements, the second game’s expansions Wacky Worlds and Time Twister, both released in 2003, included only new scenarios and scenery with the themes of world wonders and different time periods, respectively. Sadly, the new rides were merely reskins of the original ones and were listed separately from the ones they were based on in the game and the editors. These were not as well-received, not least because of their overly high price-to-content ratio at launch. Meanwhile, in that same 2003, the first game and its expansions were ported to the original Xbox, but it would appear that few people are aware of this release today. While Sawyer was busy doing a sort-of sequel to Transport Tycoon, called Chris Sawyer’s Locomotion, he was also the executive producer on Frontier’s next game – RollerCoaster Tycoon 3, released on 2 November 2004. It was the series’ first entry to 3D using Frontier’s proprietary Cobra engine (that’s being used to this day, with major upgrades) and its main feature was the ability to experience the rides from a first-person perspective. Staff now also had satisfaction levels, could be trained and their wages were customizable. Each scenario had three different difficulties, the objectives of which had to be done in succession. Stalls and shops had more customizable elements (e.g. optional ice cubes and lemon slices for drinks), VIP guests would arrive from time to time, and players could make synchronized fireworks using the MixMaster tool. Custom music could be properly imported through the game’s interface, and even custom images could be used for signs. However, the game launched in a buggy state, and some memory leaks were left unresolved to this day. Many fans accepted the game, but the majority remained with the first two titles. While not nearly as exciting as the real thing, RCT3's first-person mode helps understand the meaning of ride statistics. In a way, Frontier made up for the weak RCT2 expansions by releasing meatier ones for the third game. On 22 June 2005, they released Soaked!, which introduced pools and all the items you’d see in an aqua park. They also started adding something that was missing in RCT3 compared to the originals, and that was proper tunnelling support for paths and rides, though that was only really implemented in the little-known official patch for Soaked!, so the change is generally attributed to the second expansion online. That second expansion, Wild!, was released on 25 October 2005, and introduced the ability to place live animals (currently alive or extinct), basically entering the territory of Microsoft’s Zoo Tycoon series. Then came a silence for many years. Atari, to whom Sawyer had licensed the usage of the IP as the legal successors of his prior partners (MicroProse and Infogrames), had even filed for bankruptcy in 2011 and had allegedly even put the IP’s license for sale, even though Sawyer has had ownership of the IP in his own hands since the beginning. However, Atari somehow survived, and in 2012 they released RollerCoaster Tycoon 3D, a largely ignored Nintendo 3DS exclusive developed by n-Space. The real shocker came on 10 April 2014, when they released the unthinkable RollerCoaster Tycoon 4 Mobile for Android and iOS, which barely had any gameplay, let alone any that would nod to the prior games in the series (paths serving no real purpose, notably), and had the audacity to have loads of microtransactions. It was even a purchasable game at launch, and only after stark criticism did it become free-to-play with those microtransactions intact. This, combined with EA’s rightfully hated Dungeon Keeper (Mobile) game from just half a year prior that attempted to do pretty much the same thing, drew attention to the practices big publishers employed in the mobile market, tainting it further in the eyes of the general gamer public. To contrast this, Chris Sawyer himself released a mobile game called simply Transport Tycoon (in truth a port of Chris Sawyer’s Locomotion) on 2 October 2013 to some success. In 2015, Atari even called Frontier to port RCT3 for smartphones, despite the hanging issue of unpaid royalties for the by-then decade-old PC version. So after that debacle, Atari decided to create two more RCT games. 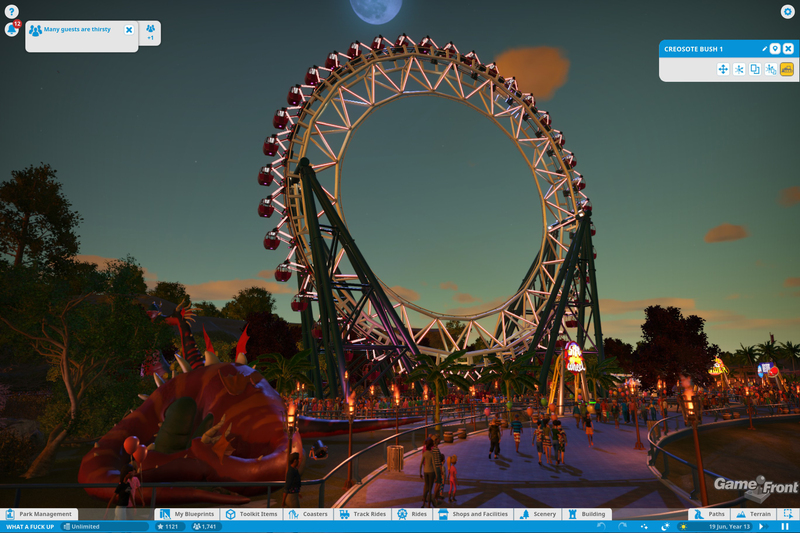 After many developer changes and an excruciating development, RollerCoaster Tycoon: World was ultimately released on 16 November 2016 to international ridicule, not least of which because within the same 24 hour period, Frontier Developments released their own independent creation called Planet Coaster, which involved everything good about their RCT3 game (including the exact same engine on steroids!) with fixes in areas where it had failed. Another independent production, Parkitect (ultimately finished on 29 November 2018) inspired by the isometric titles in the RCT series, was deep into development and had available high-quality WIP builds at that time, to further stress how lacking RCT World was in every aspect. Planet Coaster, seen here with a park made by GameFront's own Danny, is everything RCT3 could have been if it were left in development a bit longer, and looks gorgeous. The second 2016 RCT game, however, was the competent and successful RollerCoaster Tycoon Classic, which had Chris Sawyer involved for the first time since RCT3: Wild!. It was an Android and iOS port of RCT1 and RCT2, with the contents of the latter’s expansions and editors being available as admittedly overpriced DLC (again!). However, someone had the “bright” idea to re-port that back to the PC on Steam on 28 September 2017 (with the DLCs already included), which was quite unnecessary since the fans had not only had those games in relatively stable states from GOG and Steam (which are cheaper, too), but there was also the OpenRCT2 project that had become the de facto way to play those games and was fully compatible with all their existing content. To this day, some newcomers are confused on which to buy. 2017’s mobile game RollerCoaster Tycoon Touch was seen as just another attempt to enforce the horribly flawed philosophy behind RCT 4 Mobile, and by the time the 2018 PlayStation 4 VR game RollerCoaster Tycoon: Joyride and the Nintendo Switch (later PC) game RollerCoaster Tycoon: Adventures came out, nobody even cared anymore. So while Atari has horribly mismanaged the series they do not even own (again, Sawyer still holds the IP through efforts of his agents at Marjacq Ltd.) and have even received a lawsuit from Frontier Developments regarding unpaid royalties over RCT3 (which is the reason it’s now unavailable for purchase online), the fanbase never abandoned the series, at least not its spirit. Most are too busy playing OpenRCT2, Planet Coaster, and/or Parkitect to care about the mediocre sequels Atari has been pushing lately, and the fansite NEDesigns still gets a lot of impressive Loopy Landscapes and RCT2 creations. Despite the grim turn of events the series has experienced in this decade, the same period has actually seen nothing but the revival of a creative community that still plays enhanced versions of the game which we celebrate today. Long live RollerCoaster Tycoon, but for crying out loud, remove it from Atari’s hands. Who would have suspected that this genre would still be relevant after 20 years? If anything, Planet Coaster goes to show that RollerCoaster Tycoon is just as fun in 2019 as it was in 1999, and just as loved. Try to imagine 10 years from now, the magic of Planet Coaster 3. We probably will be in fully-functional holodecks.